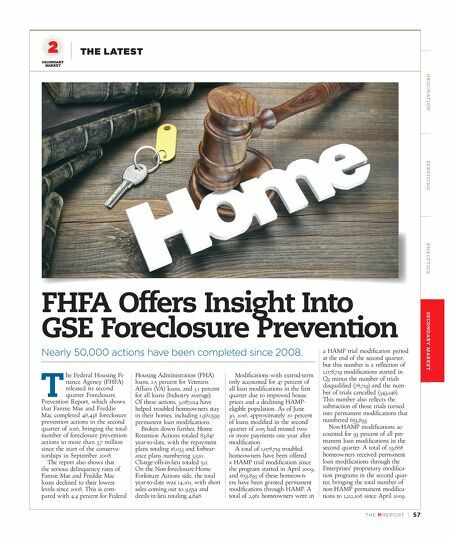 TH E M R EP O RT | 57 O R I G I NAT I O N S E R V I C I N G A NA LY T I C S S E C O N DA R Y M A R K E T SECONDARY MARKET THE LATEST FHFA Offers Insight Into GSE Foreclosure Prevention Nearly 50,000 actions have been completed since 2008. 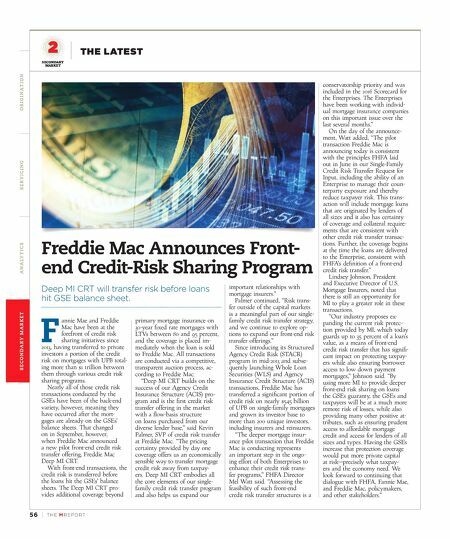 T he Federal Housing Fi- nance Agency (FHFA) released its second quarter Foreclosure Prevention Report, which shows that Fannie Mae and Freddie Mac completed 48,438 foreclosure prevention actions in the second quarter of 2016, bringing the total number of foreclosure prevention actions to more than 3.7 million since the start of the conserva - torships in September 2008. The report also shows that the serious delinquency rates of Fannie Mae and Freddie Mac loans declined to their lowest levels since 2008. This is com- pared with 4.4 percent for Federal Housing Administration (FHA) loans, 2.5 percent for Veterans Affairs (VA) loans, and 3.1 percent for all loans (Industry average). Of these actions, 3,087,014 have helped troubled homeowners stay in their homes, including 1,962,599 permanent loan modifications. Broken down further, Home Retention Actions totaled 83,847 year-to-date, with the repayment plans totaling 16,033 and forbear - ance plans numbering 3,520. Charge-offs-in-lieu totaled 521. On the Non-foreclosure-Home Forfeiture Actions side, the total year-to-date was 14,202, with short sales coming out to 9,554 and deeds-in-lieu totaling 4,648. Modifications with extend-term only accounted for 47 percent of all loan modifications in the first quarter due to improved house prices and a declining HAMP- eligible population. As of June 30, 2016, approximately 20 percent of loans modified in the second quarter of 2015 had missed two or more payments one year after modification. A total of 1,078,719 troubled homeowners have been offered a HAMP trial modification since the program started in April 2009, and 653,893 of these homeown - ers have been granted permanent modifications through HAMP. A total of 2,961 homeowners were in a HAMP trial modification period at the end of the second quarter, but this number is a reflection of 1,078,719 modifications started in Q2 minus the number of trials disqualified (78,719) and the num - ber of trials cancelled (343,146). This number also reflects the subtraction of those trials turned into permanent modifications that numbered 653,893. Non-HAMP modifications ac - counted for 93 percent of all per- manent loan modifications in the second quarter. A total of 29,668 homeowners received permanent loan modifications through the Enterprises' proprietary modifica - tion programs in the second quar- ter, bringing the total number of non-HAMP permanent modifica- tions to 1,212,208 since April 2009.